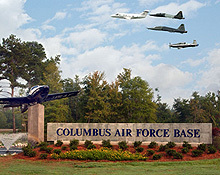 Columbus Air Force Base is located in Columbus, Mississippi, and is home to the 14th Flying Training Wing, Air Education and Training Command. Columbus is considered a low-cost military town and is home to many retirees. The mission of Columbus AFB is "Produce Pilots, Advance Airmen, Feed the Fight." The 14th Flying Training Wing, under the Air Education Training Command (AETC), is responsible for an intensive 52-week Specialized Undergraduate Pilot Training (SUPT) program.